The new year 2011 has ushered in a new vistas of cooperation for the people of Andhra Pradesh, Karnataka and Maharashtra by giving them an opportunity to share the surplus waters of the Krishna equitably and peacefully. Though this issue has been a matter of dispute for decades, all the three states are by and large happy now with Thursday’s ruling given by the Krishna Waters Disputes Tribunal, headed by Justice Brijesh Kumar. It is strange that without an alternative system being in place for a sovereign guarantee for import-export payments involving the transactions between India and Iran, the RBI has withdrawn from the Asian Clearing Union (ACU) being used for the purpose. The RBI, all of a sudden, declared on December 23 that all payments for crude oil imports from Iran would now have to be made through a system other than the ACU, as it was no longer a part of it. Though Haryana is ahead of Punjab and Himachal Pradesh in industrial development, the growth has been uneven and slow. Political leaders often like to take credit for industrialisation, the fact is the state has largely benefited from its close proximity to Delhi. That is why industrial units have conveniently located themselves in Faridabad, Gurgaon and Manesar. Industrialists are also driven by herd mentality. Starting with a joint venture called Maruti Udyog, the largest car-maker in the country, the Japanese have taken a special liking for Haryana. Others have followed. Some years after Truman, echoing Roosevelt, proclaimed four great freedoms for mankind — of speech and expression, of worship and from want and fear, Bob Hope added a fifth category, freedom from humbug. Its relevance was well illustrated by the BJP and the Left during the just concluded winter session of Parliament when they raucously muzzled all debate, ostensibly to save democracy from corruption and misgovernance. This is humbug of a high order. EVERY morning when I step out of my house, I first check on the presence of the million-rupee manhole cover embedded in the driveway; reverentially bow for its darshan, and then only start the day. At night, I worry about someone stealing it to become an overnight millionaire by the shortest underground route, and poor me getting into the hole as the fall guy. Or perhaps, a dubious art dealer giving a wink to the auctioneers of Paris and London – and the media raisING a stink, on yet another heritage undercover job. Prof Robert G. Edwards, a distinguished scientist, who was awarded the Nobel Prize for Physiology, 2010, is the chief architect of the in vitro fertilisation technique. Two decades back, he found the answer to infertility and made it possible for 85 per cent of infertile couples to have a child. Unfortunately, as he has been suffering from Alzheimer’s disease for the last two years, he does not even know that he has bagged the Nobel Prize. His wife and long-term scientific companion, Dr Ruth Fowler Edwards, received the prize on his behalf. In a personal tribute, Prof Pushpa M. Bhargava, noted scientist who worked with him at Cambridge University, recalls his association with Prof Edwards. Just after 1980 when Bob Edwards had purchased the Bourn House near Cambridge, England, to set up the first “test-tube” baby clinic (the Bourn Clinic) to treat infertility cases requiring what we know today as IVF (in vitro fertilisation), the technique for which he received the Nobel Prize this year, he drove me to the then heavily guarded building, and chuckled. All around, he said, were TV cameras poised on the top of the adjoining buildings to record what was happening inside Bourn House, and I would become a marked man! The new year 2011 has ushered in a new vistas of cooperation for the people of Andhra Pradesh, Karnataka and Maharashtra by giving them an opportunity to share the surplus waters of the Krishna equitably and peacefully. Though this issue has been a matter of dispute for decades, all the three states are by and large happy now with Thursday’s ruling given by the Krishna Waters Disputes Tribunal, headed by Justice Brijesh Kumar. Differences do persist among these states regarding some of the provisions in the tribunal award. However, these can be resolved through consultations among the states and in a spirit of give and take. According to the judgement, Andhra Pradesh gets a lion’s share of the surplus water of the Krishna while those of Karnataka and Maharashtra have been substantially enhanced. Andhra Pradesh will get 1001 tmc ft (thousand million cubic feet), Karnataka 911 tmc ft and Maharashtra 666 tmc ft water from the river. The tribunal has allowed Karnataka to store more water in the Almatti dam. As a result, the Karnataka government can now raise the dam height from 519.6 metres to 524.25 metres as directed by the tribunal. The height of the dam itself has long been mired in controversy with both Andhra Pradesh and Maharashtra having objected to it. While Andhra Pradesh feels that the dam height would adversely result in changes in the state’s cropping pattern as also impact projects like Srisailam and Nagarjunasagar, Maharashtra says that it would increase the risk of floods in Kolhapur, Satara and Sangli. Maharashtra Chief Minister Prithviraj Chavan has said that his government, within the three-month period given for clarification, will propose the setting up of a joint committee to manage the operations of the Almatti dam in a manner that the water is released in stages and without causing floods in the Maharashtra side. Andhra Pradesh should have no cause for worry because it got the maximum share of the surplus waters. Chief Minister Kiran Kumar Reddy has said that the government would study the judgement first before reacting to it. Of course, it needs all his skills to convince the people that the tribunal verdict will not hit the medium and minor projects taken up under the late Chief Minister Y.S. Rajasekhar Reddy’s Jalayagnam scheme. Water is a precious commodity and every state is plagued by shortages, often leading to riots, road blocks and other disturbances and disputes for getting water. The Cauvery water riots between Karnataka and Tamil Nadu are fresh in memory. However, there will be no scope for disputes if the state governments rise above narrow considerations and share water as a national resource. It is strange that without an alternative system being in place for a sovereign guarantee for import-export payments involving the transactions between India and Iran, the RBI has withdrawn from the Asian Clearing Union (ACU) being used for the purpose. The RBI, all of a sudden, declared on December 23 that all payments for crude oil imports from Iran would now have to be made through a system other than the ACU, as it was no longer a part of it. The RBI withdrew from the ACU after the European Central Bank asked for a certificate that the crude being imported with the use of the euro does not fall in the category of the goods included in the US sanctions list. Obviously, the RBI decision aims at avoiding any dispute with the European Central Bank, which must have acted as a result of invisible pressure from the US. But this may lead to a major crisis for India’s energy sector, as Iranian crude import comes to around 12 per cent of India’s total oil requirement. This is bound to have its impact on the oil availability in the country. It is just not possible to get from other sources 10 billion barrels of oil, which was about to reach from Iran in January. If the supplies from Iran are not cleared soon, India will have to make frantic efforts to overcome the shortage, and this may push up the prices at the international level. Iran, too, will be losing $11 billion annually which it had been receiving from India for crude import. It is in the interest of both countries to ensure that the crude supplies remain unaffected. There is a clear message for Iran. The US and its Western allies will do all they can to punish Iran for its refusal to abandon its controversial nuclear programme. Iran has already suffered a major setback with the Iran-Pakistan-India (IPI) gas pipeline project having failed to take off owing to the US factor. This is the time for the Iranian leadership to sit up and take a fresh look at its unrealistic nuclear ambitions. Post-liberalisation, foreign direct investment has picked up and accelerated the pace of industrialisation in India. Haryana has got a good share of the cake. Barring stray cases, peaceful labour relations have also helped. However, the situation has changed now. A steep rise in land prices in the National Capital Region in recent years has come as a dampener. The high cost of land acquisition has led a number of industrial projects to be shelved. Unitech, a real estate firm, has abandoned its Rs 22,000-crore special economic zone project at Kundli in Sonepat district. The SEZ projects proposed by Reliance Industries and DLF at Gurgaon and Jhajjar are also facing problems. Hotmail founder Sabeer Bhatia is dragging his feet on the Rs 1,800-crore nanocity project. The Haryana government’s latest industrial policy, unveiled on Thursday, should be seen in this backdrop. Its focus is on luring industry to the backward areas. This will be a major challenge for the political leadership. Industry does not move by policies on paper. The basic infrastructure will have to be put in place apart from developing urban centres to meet the needs of a modern lifestyle. A reliable and fast road, rail and air connectivity has become a necessity. Haryana’s law and order needs to be better managed. So also the state’s social backwardness. The khap panchayats and the Jat agitation have soiled the state’s image. Whether the government rises to the challenge remains to be seen. The arguments used to justify this are self-serving. There is an ordained or ongoing scrutiny of the 2-G spectrum matter by the Public Accounts Committee, a CBI review of spectrum allocation from 2001 being monitored by the Supreme Court, an investigation of any policy malfeasance by a retired Supreme Court judge and a parallel investigation by the Enforcement Directorate. Since the Opposition remained dissatisfied, the Prime Minister volunteered to appear before the Public Accounts Committee and the government proposed a special session of Parliament to debate whether or not a Joint Parliamentary Committee would add value to the ongoing proceedings. The Opposition, especially the BJP, will have none of this and insists that it is not for the Prime Minister to choose the forum before which he is arraigned. It wants the constitution of a Joint Parliamentary Committee rather than a debate on the need for one as offered. This is an untenable stand and devoid of merit. The Public Accounts Committee is one of half a dozen established joint committees of Parliament under its rules of business. On the other hand, there is no standing provision for any other Joint Parliamentary Committee except by express direction of Parliament. So, for the Opposition to insist on reference of the so-called spectrum scam to the exchequer to a non-existent body that can only be constituted by a specific mandate of Parliament, is an absurdity. The Opposition insists that the government must face Parliament but will not let Parliament function or decide. This is an insult to the people of India who did not elect their MPs merely to prevent Parliament from functioning. All this is seemingly justified by the enormity of the estimated loss of Rs 1,760 lakh crore to the public exchequer as a result of mala fide rate fixation for the sale of spectrum. This is a largely hypothetical figure. The then prevailing sluggish growth of tele-density with high call rates yielded to an exponential growth in telephony and a correspondingly sharp fall in call rates, partly because spectrum was sold at fixed or low prices. This entailed transferring real national benefit from a small, elite telephonic clientele to a greatly growing segment of the public. The social cost of such a transfer cannot be described as stealing money. If enhanced connectivity promoted higher growth, investment and employment, was there no dividend to the exchequer? This is not to suggest the absence of mala fide as some illicit gain has been clearly proven. There was also delay in taking corrective action. But the range and degree of malfeasance have to be established and that is what the parallel probes currently under way are designed to establish. A thoroughgoing parliamentary debate could have brought greater clarity regarding possible failures of policy or implementation and indicated what needed to be probed or if any charges should be preferred and against whom. This was not allowed to happen. The tail assumed the right to wag the dog and the will of the people was claimed by a minority Opposition. If the premier institution of Parliament can be held to ransom in this bizarre fashion, it could next be the turn of the judiciary or the CEC to be told that unless some other norms are adopted at the whim and fancy of an assorted group of protestors, these constitutional authorities will be prevented from performing their functions. This is a recipe for anarchy. The real motivation was and is the hope of electoral advantage and the smell of power. It was not for nothing that a BJP spokesperson publicly stated that until a few weeks ago, the party could not even remotely envision electoral victory in 2014. But now the “kursi” had come into view and appeared drawing nearer by the day. Hence evidence of vaulting ambition. The Left is staring electoral nemesis in the face in West Bengal and Kerala. The more blatant conceit of the BJP is matched by its deceit in planning anti-government rallies in several states. Karnataka has been excluded as the BJP government there has been caught with its hand in the till. Blatant corruption has been exposed by the Lok Ayukta, who has been given short shrift by the state administration. The Congress, too, must turn the light inwards. It has fostered corruption and protected the corrupt. It may be procedurally correct regarding the JPC; but where is its moral authority? Surely, all sides must join hands to tackle the prevalent moral rot collectively in the coming year. When the makers of Chandigarh innocently thought of endowing the city’s manhole covers a distinct identity by casting Le Corbusier’s layout plan on them; they could have hardly suspected that they were in fact paving the streets with gold and not just covering up its underbelly. With the astronomical prices that this humble, down-to-earth objet d’art now fetches at the international auctions, it may be a smart idea to promote a ‘manhole cover treasure hunt’ during the city’s heritage day festivities. The winner would, of course, walk away with a full-size replica, and a free ticket to Paris and back. Another city where I was told one was quite walking on the streets of gold was Zurich. To step on the cobbled streets of its financial district Bahnhofstrasse, with the tons of bullion stashed in the vaults of the Swiss banks underneath, was to stroll on gold. Another aspect about Zurich’s avant-garde culture is that as home to the art movement of Dadaism, its museum proudly displays a broken urinal as the prime display. We in Chandigarh are, of course, much more covered up with our art treasures and stop at manholes only. Looking at the now rising stock of its diminishing Corbusean manhole covers, Chandigarh could perhaps now think of starting a new series to keep the Paris auctioneers upbeat, by depicting a more contemporary layout of the Changiarh-Mohali-Panchkula tricity. While the deluxe edition would be gold plated, for the economy class collectors they could be in tin. For the absolutely low-budget art collectors, we could make some special Corbusean bas-reliefs on concrete manhole covers. Perhaps, one day Chandigarh, too, like Paris would be romanticised for its sewers — and a legendry creation like Phantom of the Opera inspired by it. Hollywood has the swashbuckling James Bond — a blond in the arm — popping out from manholes, deftly escaping through intricate network of the city sewers, while the KGB keeps tumbling into them! Surely, Bollywood won’t be far behind. Perhaps time has come when we might as well make an official inventory of the remaining heritage manholes, put a golden plaque around each of them and usher in the golden era of Chandigarh. It’s a million rupee question. Bob had been a celebrity in Britain (and in many other parts of the world) for nearly three years, not only for having given IVF to the infertile couples but also ignoring the church-going crowd that felt that man had no right to interfere if God had made a couple infertile. He realised that if any organic malfunctioning could be considered a disease, infertility was the most widely prevalent disease around the world, affecting 10 to 15 per cent couples of child-bearing age, and he had given new hope to them. In fact, today, advances based on Bob Edwards’ work between 1970 and 1980 have made it possible for 85 per cent of infertile couples to have a child. * Robert G. Edwards, British biologist, with Patrick Steptoe, developed techniques that led to the first “test tube baby”, Louise Brown, and millions of other births. Their contributions to the technology of in vitro fertilisation (IVF) have made more than four million couples parents. * Working with Steptoe, Edwards, now 85, developed the technique for removing mature eggs from a woman’s ovaries, fertilising them in test tubes and inducing them to begin dividing before implanting them back in the mother. 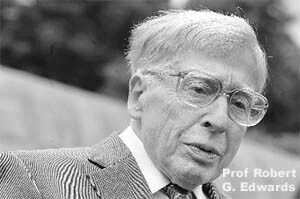 * In 1960, Edwards started to study human fertilisation, and he continued his work at Cambridge, laying the groundwork for his later success. In 1968, he was able to achieve fertilisation of a human egg in the laboratory and started to collaborate with Steptoe, a gynaecologic surgeon from Oldham. Edwards developed human culture media to allow the fertilisation and early embryo culture, while Steptoe utilised laparoscopy to recover ovocytes from patients with tubal infertility. * Refinements in technology have increased pregnancy rates and it is estimated that in 2010 about four million children have been born by IVF with approximately 170,000 coming from donated oocyte and embryos. Their breakthrough laid the groundwork for further innovations such as intracytoplasmatic sperm injection (ICSI), embryo biopsy (PGD), and stem cell research. * Many other religious groups also initially expressed concerns about the ethics of IVF. Significantly, Britain’s Medical Research Council refused to fund the experiments, spurring Edwards and Steptoe to obtain private grants. So he put all his money in the Bourn Clinic. It was a risk few would have taken, for the success rate of IVF at that time was less than 10 per cent. Louise Brown, the first so-called test-tube baby that he and the late Patrick Streptoe had delivered on July 25, 1978, was their first success after over 30 failures. But Bob Edwards recognised that nothing worthwhile in this world was ever accomplished without taking a risk, believing in oneself, and going that extra mile that others didn’t dare to walk. Bourn Hall, in the village of Bourn, became a landmark, and the techniques that Bob had pioneered spawned a host of new, related technologies. Infertility clinics (good or bad) started sprouting around the corner everywhere, specially in India which even today has no regulation to control them, over the next three decades. This mushrooming was an anathema to the innate sense of ethics and morality in Bob. So when he started his second journal (the first being, now widely known, Human Reproduction, Reproductive BioMedicine (RBM) Online, he asked me to write an article on ethical issues in modern biological technologies which was published in September 2003 issue of this journal. The IVF and related techniques were by then well accepted. The question was that of ethics in the practice of these techniques which became to be collectively known as assisted reproductive technologies (ART). As my article pointed out, the scope of unethical behaviour and practices on part of the practitioners of ART was immense, and it was being exploited fully to make easy money at the cost of ignorance of people. In delivering Louise Brown after many failures, in setting up the Bourn Clinic, and in starting two highly successful journals, Bob showed that patience, self-confidence, and a real commitment to the legitimate interests of the people based on strong ethics and highly developed professionalism, pays in the long run. He was unfazed when, in 1971, the Medical Research Council of Britain (MRC), one of the most forward-looking scientific grant-giving organisations in the world), denied financial support to Bob Edwards for work which led to the Nobel Prize. He seemed always short of money. When in 2002, I persuaded him to come to Hyderabad for the Silver Jubilee of the Centre for Cellular and Molecular Biology, which he had visited earlier, he asked if in addition to his travel, board and lodging expenses, a few hundred pounds could be paid to him. I arranged for an ART clinic in Hyderabad to do so. As a courtesy, he then visited the clinic which, today, is doubly proud of that visit. I have watched the modern biological revolution from close quarters since its beginning in 1953, and I believe that there are not many who have during this period succeeded on so many counts as Bob has. However, the fact remains that success is never the outcome of just one individual’s effort and no one is, I am sure, more aware of it than Bob Edwards. The person he would be missing the most at this time is C.R. Austin (known to his friends as Bunny Austin), without whose support all through, Bob would not have got to where he did. An unsung hero of reproduction biology, Bunny was a gentleman par excellence in the traditional British sense, who left most of the talking to his very articulate wife, Patricia. I came to know them when I was working in the National Institute for Medical Research in London during 1956-57. In the later years, he was to become the world’s foremost authority on the mammalian egg. He discovered, independently with M.C. Chang of the Worcester Foundation in New England in the US, the phenomena of “capacitation” which Bob Edwards recognised as the single most important hurdle in developing the technique of IVF – that is, fertilising the human egg with human sperm in vitro (say, in a test tube! ), allowing the fertilised egg to develop initially also in the laboratory, and then transferring the embryo thus generated outside the body, into the uterus of a woman for further normal development. Mammalian sperm are infertile when ejaculated by man. They acquire the capacity (hence the term, “capacitation”) to fertilise an egg during passage through the female reproductive tract. Therefore, for successful fertilisation of human egg by human sperm in the lab, one would need to first capacitate the human sperm. Bunny Austin moved to Cambridge as the Darwin Professor of Animal Morphology in the Physiological Laboratory of the University in the 1960s. Bob who was with Bunny at the National Institute for Medical Research, also joined him there. It was there on the fourth floor of the Physiological Laboratory that he developed the technique of capacitating the human sperm in vitro and then using the capacitated sperm to fertilise a human egg also in vitro what we know today as IVF. When Bunny moved to Cambridge, he purchased the most prestigious building in the village of Toft near Cambridge, called the Manor House. It was listed in the Cambridgeshire Directory of Heritage Buildings, and was not the most comfortable one in the world. My wife and I stayed there as guests of the Austins more than once, in an upstairs room the floor of which was sloping and creaked at each step. But the overall beauty of the building had a magical effect even on visitors and I remember many delightful evenings spent there with Bob Edwards, and his wife, Ruth. It was there that I learnt about Bob’s fascination with fast cars and fast driving, violating every rule of the road, which very few Britishers do. He could persuade me to be driven by him, I think only once! After retiring from Cambridge, Bunny and Pat migrated to a remote corner of eastern Australia, where he passed away, unknown and unsung, a few years ago. Both Bob and I lost an extremely dear friend. Bunny wasn’t even elected to The Royal Society, a grave omission on the part of the Society. Bob’s election to the Fellowship of The Royal Society, perhaps, partly made up for it. Bob has been an unusual entrepreneur who expanded his entrepreneurship to areas that are generally considered taboo for scientists. For example, he stood for membership of the British Parliament, and failed. But that was probably his only major failure. In everything else he tried, he succeeded. Bob has been a Fellow of Churchill College in Cambridge, and my wife and I remember dining at the College as Bob’s guests. There was never a dull moment when he was around, and he always livened the dinner table. The Nobel Foundation did not do Bob a favour by awarding Nobel Prize for 2010 to him. Bob should have received the Prize 20 years ago, around 1990, by which time many with much lesser accomplishment to their credit had been given this honour. As of now, he is sick. I spoke to him last nearly two years ago when I was in Cambridge. It was clear to me even then that he was very unwell. As he is not well, his wife received the Nobel Prize on his behalf. Unfortunately, this is not the first time in recent years that the Nobel Foundation has slipped. It did so when it conferred the Nobel Prize on Luc Montagnier and a colleague of his for discovering HIV, the virus that causes AIDS. It should have been shared with Robert Gallo of the US. In fact, the Nobel Prize may have been given (which would not have been right) only to Bob Gallo, but for the French government’s active and persistent intervention to protect the legitimate interest of Luc Montaignier, for Bob Gallo was far better known even for work on HIV and AIDS, and had already made several other major discoveries such as of interleukin-2 and of HTLV1 and HTLV2, the human leukaemia-causing viruses. It is a thought that if Luc Montaignier had done his work in India, he would have been probably only ridiculed as happened to Subhas Mukherjee who delivered the first Indian test-tube baby, Kanupriya Agarwal, on October 3, 1978, just 69 days after Louise Brown was born. In fact, soon after Louise Brown was born, Bunny Austin came to India at my invitation and gave a lecture in the then Regional Research Laboratory (now Indian Institute of Chemical Technology) at Hyderabad on the work of Bob Edwards. He then asked me about Subhas Mukherjee and said that if the Indian scientific community and the Government of India would certify to the brandied facts of Kanupriya’s birth, Bob Edwards would be happy to share the credit with Subhas Mukherjee. If that had happened, Mukherjee wouldn’t have committed suicide, and would have shared the Nobel Prize with Edwards. I wonder how many such opportunities we have missed and will continue to miss. It is said that when a well-known exporter of crabs from India to the US was chastised by his American customers for sending them a consignment of crabs in containers that had no lids, he told the Americans not to worry as they were Indian crabs and as soon as any of them would try to climb up, all the others would pull it down. It is this Indian Crab Syndrome that has often prevented the emergence of Indian Nobel Prize winners.